We have been visiting Las Vegas during the Christmas season for the past four years. We have put together this guide to show you what type of weather to expect, attractions and Christmas displays to visit and what to expect in general from crowds. The average temperatures for Vegas in December is a high of 58° F (14° C) and a low of 34° F (1° C). We have found that the temperatures can fluctuate quite a bit from day to day. There have been days where we have been able to wear shorts and a t shirt by day and a long sleeve and pants at night. Probably more often than not you will require long pants by day and night, a short or long sleeve shirt by day and a light jacket at night. When the sun goes down and the winds pick up at night it can fairly chilly. There seems to be differing opinions about crowd levels in Las Vegas over the Christmas Holidays and December in general. 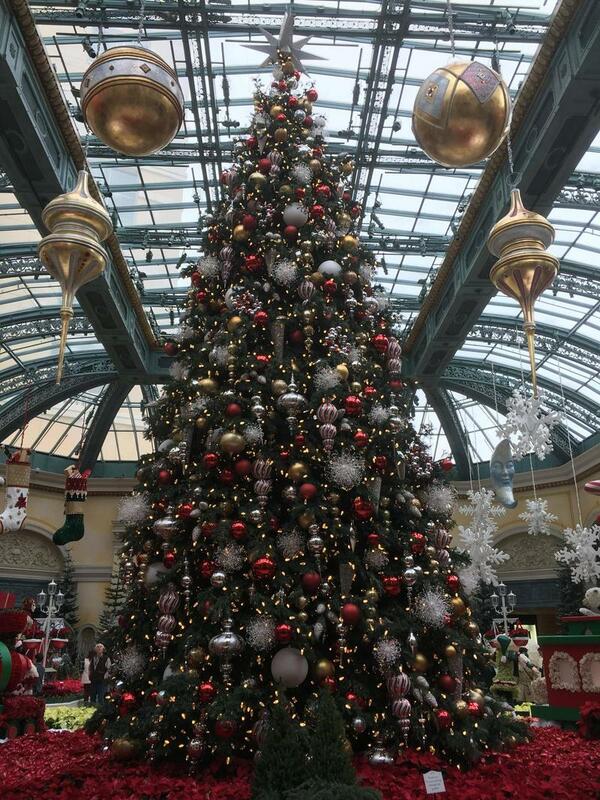 By the first week of December Christmas decorations will appear in hotels and along the strip. The first two weeks of December has The National Finals Rodeo in town for 10 days. This is the time period that we generally are in town for. It is considered by many to be a busy time in Vegas but it’s a bit relative. Any of the casinos like The Mirage, MGM or Orleans that host nightly concerts or events will be busier than others that don’t. The NFR Experience website has a list of after dark events. The following week and right up to Christmas Eve or a couple days before is generally fairly dead or empty in terms of crowd. This is because Christmas itself leading to New Years can be quite busy. Before you plan your big Vegas Christmas Vacation you should know that some shows go dark in December. This is especially true leading up to Christmas itself. It’s always best to check schedules in case you get your hopes up about seeing a show. For example, we never get a chance to see Brad Garret at his comedy club as he takes a few weeks off before Christmas and New Years. One thing we have noticed over the past 5 years is that Vegas seems to be getting into the Christmas spirit more each year. There are lots of amazing Christmas Tree Displays. The Christmas music is hit or miss but you will find it in the lobbies, shopping areas and around the buffets. Lets take a look at some of the main displays and attractions. Vegas is open on Christmas like any other day. It would be impossible to list where to dine for Christmas dinner. Your best bet would be to search out where you want to dine and look at their website or call to see if there are any Christmas dinners planned. Buffet lines can be fairly busy especially during NFR in early December and closer to Christmas. Plan accordingly. You can expect crowds as The Bellagio Conservatory is the Cadillac of Christmas displays in Las Vegas. This is probably one of the most stunning Christmas displays you will ever see. There is moving train, moving polar bears and a small area where it snows. Our next top spot is to a less degree Aria lobby and more importantly the Christmas Tree at Crystals Mall. This first photos is the display at Aria and then the tree at Crystals. Last year was our first visit to The Wynn. We went to see the Christmas display and we were not disappointed. Not as grand as The Bellagio it was still a site to behold. The Park area is relatively new but that doesn’t mean that they don’t celebrate Christmas. You will another large Christmas tree as well as decorations, lights and music. It is especially lively if there is a sports event or concert in the area. Visit at night to get the full effect of the lights. Last year in 2017 they had a skating rink but it was not real ice. It was plastic surface and it was very small. This view is from the the open outdoor bar inside the t-mobile arena. I wouldn’t say that Fremont St goes overboard with the Christmas spirit but they do have a tree. They also have a number of filthy Santa’s but they might have those on any other given day. Many of the casinos will also decorate their main lobbies or their shopping malls with Christmas cheer. For example, The Mirage, Caesars Palace and Harrah’s put up miscellaneous decorations. The Venetian also does up the area where the waterfall is located (photo below). There are a few Christmas themed activities to visit which we have not taken part in but are recommended. This would be The Ethel M. Chocolates Cactus Garden holiday display which is free to visit. There is also The Glittering Lights at Las Vegas Motor Speedway where you can drive the track or take a tram which is lite up Christmas lights and decorations. There are generally Groupon deals for both of these activities. Our first trip back in 2014 there was ice skating located at Caesars Palace and we have heard that there was also skating at The Venetian. For the past couple of years there is only ice skating at The Cosmo. They have a real ice surface on top of their pool and you can rent skates. You can also reserve a fire pit area and do the whole smores experience. There is also a Groupon for this event. We tried it one time and had a great time. This is a stock photos as ours did not turn out well.